I have just finished eBay Patcher version 0.1 - this is a cli tool that uses the method I have described here for changing the eBay site id. 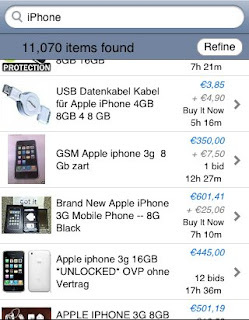 This will allow anyone (with a jailbroken iPhone and iTunes US account) to use other eBay sites (ebay.co.uk, ebay.de, ebay.nl and so on) from the native eBay application, available for free at iTunes. Cydia Package is available from the iPhone-Patch repository. BG Keyboard and BG Fix Updated. I have updated BG Keyboard and BG Fix to version 1.0, since they are stable and somehow complete. I made a small iPhone optimized site about my projects - you can check it here. I'm almost done with my eBay Patcher application, and I hope there will be a beta out soon. eBay hack maybe have some flaws; Application on the way.. The eBay international hack I posted earlier seems to make the application unable to start after reboot or sync. I'm not sure, I did not receive any feedback at all. This happened to me twice, and I think it's because of the checksum verification. Once the application is in "Unable to start" state I was unable to make it work without uninstall and install. 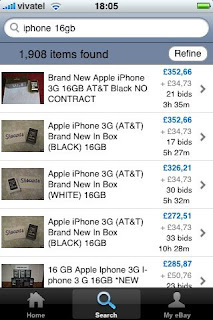 If this happens to you - just reinstall the eBay application and follow the steps described here. Currently I'm working on a small patcher application, that will be able to switch between different eBay site versions, in the next few days it will be available on my repository. More instructions how to add it are available on the iPhone-Patch project on Google Code. After finding out that there are no international versions for the native iPhone eBay application (I use eBay.co.uk), I decided to make a move.. And after a few hours - success.. Install the eBay application (you should be in US region in iTunes). Go to the applications folder (invoking cd `find ~mobile -type d -name "eBay.app"` should send you there. Convert the applications preferences to xml1 format - run plutil -cxml1 appdefaults.plist. The file now can be edited. Start the application and you should be using the .co.uk version now! UPDATE 19.08.08: Important - read this article! The 0.3 "Unhappy release" is tested against 2.0.1 and works fine. It's 'Unhappy', because every feature I had planned was unable to enter because of various reasons, mainly not enough time. Installation instructions can be found at the Bulgarian Phonetic Keyboard site. I have wasted few days in reversing the dictionaries (I'll post later) and was able to find the basic structure of the .dat file (from position 0x80), except the header (0x00 - 0x1b). The index file is still untouched. I have used some knowledge from iPhone-Shop project and as soon as I make some progress, I'll publish my work at my iPhone-Patch project page. I have reversed several binaries, looking for some interesting stuff, without any major success. 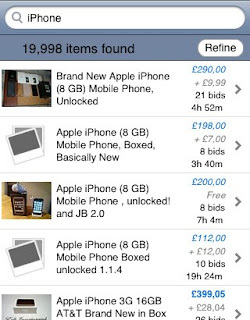 Now I'm planning to reverse eBay application to make it work with the UK version of the site (and I have some success). That's all for me now..
Open console or ssh to your iPhone. Create a temporary directory and upload your .ipa file there. If you don't have unzip on your phone, install it by typing apt-get install unzip as root. If you don't know what you're doing, this should make the application work (but better learn the unix permissions). You can clean the directory, where we extracted the .ipa. Lets respring now by doing killall SpringBoard and you're ready! Last month IDA 5.3 was announced. There are massive ARM disassembly improvements, iPhone debugging capability and a native console iPhone interface! I wish I could afford buying a copy, Ilfak Guilfanov realy deserves it. I have reopened my blog and redirected a new url to it. I'll post my progress for the projects I do and interesting stuff I find on the net.